1305500970 -Expanding on its widely respected and unique focus on the critical role of professionals in education, psychology, counseling, health care, and human services, HUMAN EXCEPTIONALITY: SCHOOL, COMMUNITY, AND FAMILY, 12th Edition, is an evidence-based testament to how cross-professional collaboration enhances the lives of exceptional individuals and their families. This text’s unique lifespan approach combines powerful research, evidence-based practices, and inspiring stories, engendering passion and empathy and enhancing the lives of individuals with exceptionalities. 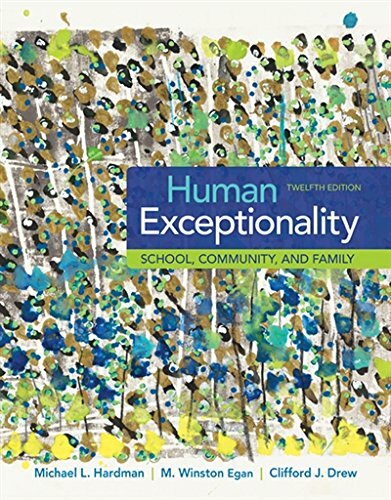 Designed to help students experience individuals with disabilities and their families in a personal and intimate fashion, HUMAN EXCEPTIONALITY is an excellent resource for preparing both preservice and practicing teachers, as well as a range of other human services professionals in the fields of psychology, sociology, social work, and the health sciences.